Copyright (C) 1999-2009 Global Relay Communications Inc. All Right Reserved. Not to be reproduced without permission. The Global Relay Message Archiver and Compliance Reviewer (Message Archiver) User Guide is intended for persons responsible for reviewing messages (Email, Instant Messages, Thomson Reuters, Bloomberg and Blackberry (PIN and SMS) using the Message Archiver - such as Compliance Officers. The guide is also intended for those responsible for the administration of the system, such as System Administrators. 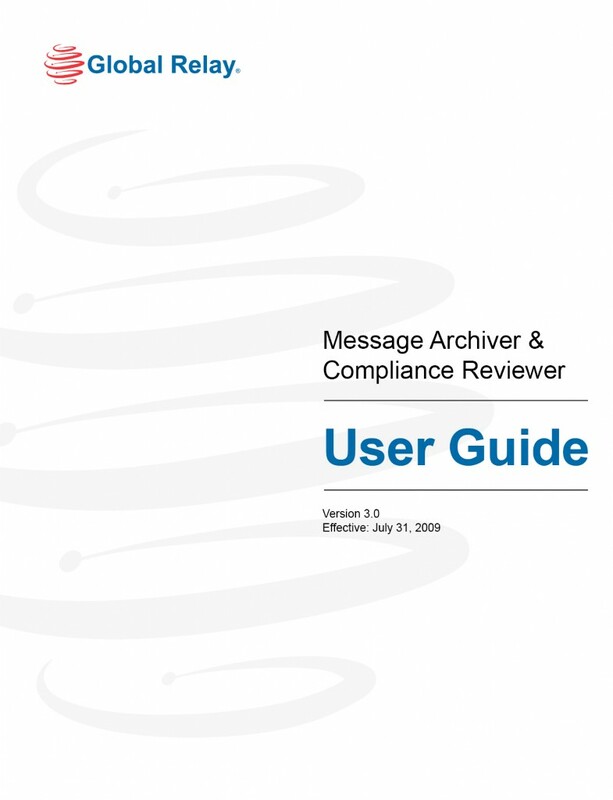 The User Guide is to provide detail on how to use the Message Archiver to search for and review messages, primarily for compliance purposes, but also for other types of risk containment with employees. The User Guide also explains how to Manage or Administer your Users (i.e. creating Groups or granting levels of access) within the Message Archiver. 1.866.484.6630 or you can email Global Relay's Technical Support department at support@globalrelay.net. Purpose of this document --------------------------------------------------------------------------------------------------2? Intent of the User Guide-------------------------------------------------------------------------------------------------------- 2? Questions or Suggestions ------------------------------------------------------------------------------------------------------ 2? 1.1? Terms Defined ---------------------------------------------------------------------------------------------------------- 5? 1.2? Message Archiver User Types ------------------------------------------------------------------------------------------ 7? Item 2 Overview of the Archiver User Interface-------------------------------------------------------------------------9? 2.2? Local Language User Interface Support ------------------------------------------------------------------------------- 9? 2.3? Setting Preferences ----------------------------------------------------------------------------------------------------- 10? 2.4? Overview of the Main Screens ----------------------------------------------------------------------------------------- 11? 2.4.1? Standard Search Page --------------------------------------------------------------------------------------- 11?
? Search Page for Users without Access to the Compliance Tools ------------------------------------------ 13?
? Compliance Reviewer's Search Page (Reviewers and Super Reviewers) -------------------------------- 15?2.4.4? Results Page -------------------------------------------------------------------------------------------------- 16? 2.4.5? Message Page ------------------------------------------------------------------------------------------------ 17? 2.4.6? Other Main Toolbar Menus ----------------------------------------------------------------------------------- 19? 2.5? Compliance Dashboard ------------------------------------------------------------------------------------------------- 20? Item 3 Searching for Messages --------------------------------------------------------------------------------------------21? 3.1? Searching by Dates ----------------------------------------------------------------------------------------------------- 21? 3.2? Searching by Users and Groups --------------------------------------------------------------------------------------- 21? 3.3? Searching by Subject --------------------------------------------------------------------------------------------------- 22? 3.4 ? Searching by Attachments -------------------------------------------------------------------------------------------- 22? 3.5? Searching by Keywords ------------------------------------------------------------------------------------------------ 23? 3.6? Searching for Flagged Messages and Message States --------------------------------------------------------------- 23? 3.6.1? Types of Flags and Message States ------------------------------------------------------------------------- 23? 3.6.2? 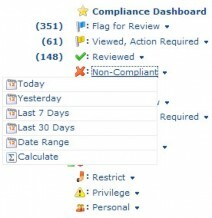 Using the Compliance Dashboard --------------------------------------------------------------------------- 25? 3.6.3? Searching by Priority ----------------------------------------------------------------------------------------- 25? 3.7? Searching by Labels ---------------------------------------------------------------------------------------------------- 26? 3.8? Searching by Events---------------------------------------------------------------------------------------------------- 26? 3.9? Searching by Serial Number ------------------------------------------------------------------------------------------- 27? 3.10? Performing Sample Searches------------------------------------------------------------------------------------------ 27? 3.10.1? Automated Random Sampling ----------------------------------------------------------------------------- 27? 3.10.2? Manual Sample Search ------------------------------------------------------------------------------------- 29? Item 4? Viewing Search Results ----------------------------------------------------------------------------------------30? 4.1? Sorting Search Results ------------------------------------------------------------------------------------------------- 30? 4.2? Marking Messages on the Search Results List------------------------------------------------------------------------- 30? 4.2.1? Marking Messages as Reviewed ----------------------------------------------------------------------------- 30? 4.2.2? Marking Messages with a Priority Level --------------------------------------------------------------------- 31? 4.2.3? Marking Message States ------------------------------------------------------------------------------------- 31? 4.3? Saving Messages from the Search Results List ----------------------------------------------------------------------- 32? Item 5? Viewing and Saving Messages----------------------------------------------------------------------------------33? 5.2? Marking Messages ------------------------------------------------------------------------------------------------------ 34? 5.2.1? Marking Messages as Non-Compliant ----------------------------------------------------------------------- 35? 5.3? Flagging Messages from the Message Header ------------------------------------------------------------------------ 36? 5.4.1? Creating Folders ---------------------------------------------------------------------------------------------- 37? 5.4.2? Viewing Active Folders --------------------------------------------------------------------------------------- 37? 5.4.3? Viewing a Folder's Contents --------------------------------------------------------------------------------- 39? 5.4.5? Adding User Access to Folders------------------------------------------------------------------------------- 39? 5.4.6? Removing User Access to Folders --------------------------------------------------------------------------- 39? 5.4.7? Adding Group Access to Folders ----------------------------------------------------------------------------- 39? 5.4.8? Removing Group Access to Folders ------------------------------------------------------------------------- 39? 5.4.9? Adding Messages to a Folder -------------------------------------------------------------------------------- 40? 5.4.10? Adding Messages to a Folder from the Results Screen --------------------------------------------------- 40? 5.4.11? Adding Messages to a Folder from the Message Screen -------------------------------------------------- 40?5.4.12? Removing Messages from Folders ------------------------------------------------------------------------- 40? 5.4.13? Removing Messages from a Folder from within the Folder ----------------------------------------------- 40? 5.4.14? Removing Messages from a Folder from the Message Screen-------------------------------------------- 41?5.4.15? Deleting Folders--------------------------------------------------------------------------------------------- 41? 5.4.16? Searching Folders with Text Strings ----------------------------------------------------------------------- 41? Item 6? Working with Users and Groups -------------------------------------------------------------------------------42? 6.1? Adding Users ------------------------------------------------------------------------------------------------------------ 42? 6.2? Managing Users --------------------------------------------------------------------------------------------------------- 43? 6.2.1? Using the Active Directory ----------------------------------------------------------------------------------- 43? 6.2.2? Modifying User Details --------------------------------------------------------------------------------------- 44? 6.2.3? Changing Access Rights-------------------------------------------------------------------------------------- 45? 6.2.4? Modifying User Settings-------------------------------------------------------------------------------------- 46? 6.2.5? Additional User Management -------------------------------------------------------------------------------- 46? 6.3? Working with Groups --------------------------------------------------------------------------------------------------- 47? 6.3.1? Creating a Group --------------------------------------------------------------------------------------------- 47? 6.3.2? Adding Users to a Group------------------------------------------------------------------------------------- 47? 6.3.3? Removing Users from a Group ------------------------------------------------------------------------------ 48? Item 7? Using Compliance Tools -----------------------------------------------------------------------------------------49? 7.1? Working with Flagging Rules ------------------------------------------------------------------------------------------- 49? 7.1.1? Adding Keywords and Phrases------------------------------------------------------------------------------- 49? 7.1.2? Excluding Keywords and Phrases---------------------------------------------------------------------------- 50? 7.1.3? Creating Flagging Rules for Other Exclusions--------------------------------------------------------------- 50?7.2? Labeling Messages ------------------------------------------------------------------------------------------------------ 50? 7.2.1? Creating Labels and Comments ----------------------------------------------------------------------------- 51? 7.2.2? Adding Labels and Comments to Messages----------------------------------------------------------------- 52?
? Adding Labels/Comments to Messages from the Results Screen ---------------------------------------- 52?
? Adding Labels/Comments to Messages from the Message Screen---------------------------------------- 53?7.2.5? Removing Labels and Comments from Messages ---------------------------------------------------------- 53?7.2.6? Removing a Label/Comment from Messages from the Label/Comment Screen ------------------------- 53?7.2.7? Removing a Label/Comment from Messages from the Message Screen --------------------------------- 54?7.2.8? Sharing Labels------------------------------------------------------------------------------------------------ 54? 7.2.9? Deleting Labels ----------------------------------------------------------------------------------------------- 55? 7.3? Using Wizards ----------------------------------------------------------------------------------------------------------- 56? 7.3.1? Creating and Defining a Wizard ----------------------------------------------------------------------------- 56? 7.3.2? Assigning a Wizard to Messages----------------------------------------------------------------------------- 57? 7.3.3? Giving User Access Rights to Wizards ----------------------------------------------------------------------- 59? 7.3.4? Removing User Access Rights to Wizards ------------------------------------------------------------------- 59? 7.3.5? Giving Group Access Rights to Wizards --------------------------------------------------------------------- 59? 7.3.6? Removing Group Access Rights to Wizards ----------------------------------------------------------------- 60? Item 8? Technical Support -----------------------------------------------------------------------------------------------61? Item 9? Legal Information -----------------------------------------------------------------------------------------------62? 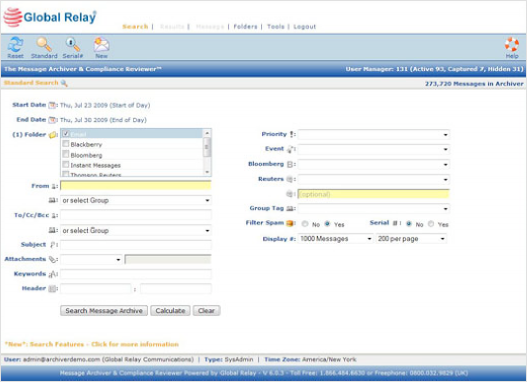 Global Relay Message Archiver (Message Archiver) is a hosted compliance solution. All related facilities and equipment are located off premises from the Users. The Message Archiver helps financial and other companies meet regulatory demands and contain certain risks relating to messaging and to employees. 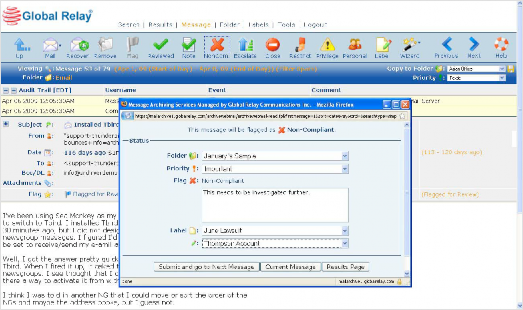 The Message Archiver provides a secure, web-based console from which compliance reviewers can review electronic messages. It can provide Compliance Officers company-wide access to all messages. 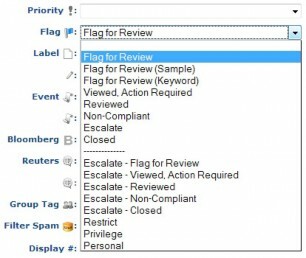 Flagging Rules prepare messages for review with automated keyword and phrase scanning, random sampling and message categorization. This User Guide provides full detail on how to use the Global Relay Message Archiver to search for and review Email, Instant Messages, Thomson Reuters, Bloomberg and Blackberry (PIN and SMS) messages for compliance purposes. It is suggested that you fully read both Item 1 and Item 2 before going on to other sections that describe how to perform specific tasks. The following table defines Terms as they are used in the Message Archiver and in this User Guide. A permanent chronographical sequence of all actions taken while conducting any message review. Each record contains information directly related to and resulting from any action taken with a message. A subcategory of a Label; used together, they provide a method of marking or organizing a message or set of messages. Typically used for collaborative compliance review or for marking messages during discovery. Set of links for quick access to compliance searches and statistics, available to Reviewers and Super Reviewers. Status assigned to messages that require further investigation, typically by the next higher level of compliance review. Flag for Review, Viewed Action Required, Reviewed, Non-Compliant or Escalated; Closed or Open; and Restricted, Privileged or Personal. Messages are typically flagged by the Flagging Rules and reviewed by compliance personnel as the primary method of meeting SEC/FINRA/IIROC/FSA compliance requirements. A tool to save the results of searches, categorize messages, work collaboratively or to help organize data. Personal folders can be created by any User type, but can only be shared by a Super Reviewer. Message Archiver tool for searching and creating personal folders. A defined block of Users. Groups can be used to organize enterprise entities, to grant a User access to a specific block of Users, or to be able to search on a specific subset of Users. The grey area above the body of a message that displays the Subject, From, Date, To, and Attachment fields that are associated with the message. Search criteria, in the form of either a word or a phrase. Keyword searches header, text body and attachments of all messages. Keywords are highlighted in the search results (excluding attachments). A tool available to Reviewers and Super Reviewers. A Label may include multiple Comments for categorization and search purposes. Labels may be thought of as Folders. Comments would be considered as sub-Folders. Used together, they provide a method of predefining compliance structures for collaborative review or discovery of messages. A tool for searching and creating Labels. Available to Reviewers and Super Reviewers. Status assigned to any message that contains a breach of your firm's policies or procedures. Status assigned to messages that may be viewed only by the User who sent or received those messages and by Super Reviewers. It is used to block other Users, that would normally have access, from viewing these messages in the Message Archiver. A pre-determined status marker, such as Urgent, Important, Pending, etc. that allows you to organize and search on specific messages. Status assigned to messages that contain Attorney-Client Privileged information. These may be viewed only by Super Reviewers and are typically used to block Auditors/Examiners from viewing these messages. Search that displays a random sampling of the search results, based on the assigned percentage. With a 50% sample and a search result of 20 messages, the displayed result would be a statistical random sampling of 10 of those 20 messages. The status assigned to messages that may be viewed only by Super Reviewers. This status is typically used to block internal Users from viewing sensitive messages. Unique numerical identifier assigned by the Message Archiver to every logged message. Reviewer with the most comprehensive level of access to the Message Archiver, typically a Chief Compliance Officer (see 1.2 for details). Set of predefined actions that you may want the Message Archiver to perform on a message or set of messages. Tool for creating, organizing and searching Wizards. The Message Archiver supports the following designated User Types, and enables flexible User access rights to be configured to fit the customer's Compliance, Legal, HR, and IT teams, as well as employees. The most comprehensive highest level of Message Archiver access, typically granted to a Chief Compliance Officer or to executive management. Super Reviewers generally have firm-wide access to all User messages (though this can be limited), have the ability to mark or read Attorney-Client Privileged, Restricted or Personal messages and also have the ability to modify the list of keywords keywords or phrases and Random Sampling for Flagging. Similar to Administrators, Super Reviewers have access to the Management Tools in the system. Like a Reviewer, they also can perform all the functions of a Reviewer by having access to the Flagging and Compliance tools. The overall manager or controller of the system. Similar to the Super Reviewer, System Administrators can create accounts and assign access rights to build the structure of the company (i.e. create Groups etc.). The System Administrator (or Super Reviewer) can also input a list of keywords and phrases for flagging purposes. System Administrators have firm-wide access to messages but they do not have access to view any of the Compliance or Flagging Tools tools such as keyword flagging, random sampling or compliance Audit Trails. User Administrators can create any User Type (excluding the System Administrator). They can configure each User's preferences and each User's access rights to the messages of one or more additional Users, and/or one or more Groups of Users and their associated messages. The User Administrator does not have access to Compliance Tools such as Keyword Flagging rules, Random Sampling or compliance Audit Trails. Reviewers are typically in a compliance or management role, and are usually responsible for the first level review. By default, Reviewers have access to only their own messages with any additional User/Group access assigned to them by a System Administrator, User Administrator or Super Reviewer. Only then can a Reviewer analyze flagged messages. If applicable, a first level Reviewer may "Escalate" messages of concern to a Super Reviewer for further evaluation. Reviewers may not mark, access or read messages marked as Attorney-Client Privilege, Restricted or Personal. Standard Users are typically regular employees with access only their own messages. If needed, Standard Users can also be assigned access to the messages of other Users or Groups by a Super Reviewer, System Administrator or User Administrator. Standard Users do not have access to the System Tools, and they cannot see any of the Audit or Flagging tools, compliance comments or the full Audit Trail of a message. Disabled Users are often former Users who currently have no access to log into the Message Archiver. Messages for these Users are being archived and are searchable by an Administrator or Super Reviewer (Users with access to 'All Mail'). Typically Disabled Users include former Active Users (i.e., ex-employees). It also would include firms that are archiving and reviewing messages without their employees' knowledge (typically for monitoring purposes). Active Users are those who have been added from the 'Captured' directory into the Message Archiver's 'Active' directory. Once in the 'Active' directory, Users can be organized or managed, with such actions as being put in Groups or being given a level of access to the Archiver. Secondary Users are an email address from domain that is being archived along with the primary domain; - such as a subsidiary company. Secondary domains can be added by User or Systems Administrators under Tools -> Preferences -> Secondary Domains. There is no limit to the number of secondary domains that can be added. However these domains must be ones that you are actively archiving into your Message Archiver. External Users are typically an address from outside of the firms' domains, such as johnsmith532@bloomberg.net, that has an ID Mapping to a User account. Captured Users are those who have actively sent out emails, and so were automatically captured by the system, but they cannot be managed (put in Groups or given a level of permission to access the system) until they are made 'Active'. It is generally a temporary state or situation, usually the result of a new User being identified by the system before being granted access to the system. Messages for these Users are being archived and are searchable by an Administrator or Super Reviewer (Users with access to 'All Mail'). Hidden Users are those who no longer need to be managed. They are typically addresses used for notification purpose (non-human addresses) or from past employees who no longer need to be part of your list of 'Active' Users for management purposes. Refer to Item 6 for information on how an Administrator or Super Reviewer can assign/reassign User Types. Item 2 provides a high-level overview of the Message Archiver User Interface for compliance officers, other reviewers and Administrators. Detailed instructions for performing specific actions are provided in subsequent sections of this document. The Login page can also be found by going to www.globalrelay.com and clicking on the Login link (upper right side of the page) and clicking on the 'Message Archiver' option. The default Login page is Standard Search page. 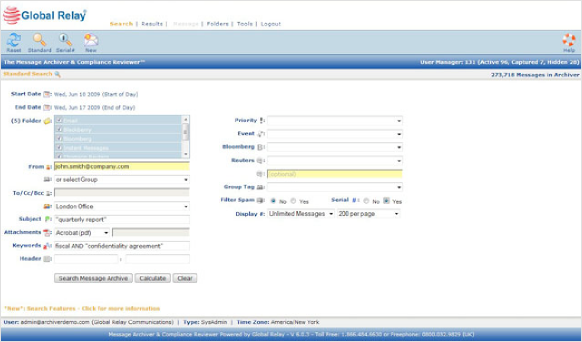 Your preferred Language can be selected from the dropdown menu of the Message Archiver Login page. Once you are logged into the Message Archiver, you can change the language from the Main Toolbar, using Tools > Preferences > User Settings > Language. Choose from the dropdown menu the language preference for your own user interface. Administrators can set a domain-wide language preference from this screen. For more on setting User Preferences, see Item 2.3 in the next section. Language option is in the middle column of the User Settings section. For more on user management by way of the User Manager tool, refer to Item 6.2.2. To view and set User Preferences, select from the Main Toolbar Tools > Preferences. Options for User Preferences depend on your User Type status, as is described below. Standard Users and Super Reviewers can use the Preferences screen (below) to change their passwords, language preference, time zone and display results per page, in the User Settings section at the lower part of the screen. They can also view, but not modify, their access rights, in the User Access Rights and Group Access Rights sections of the screen. In the example below, the User has Super Reviewer User Type designation and has been granted the right to access All messages in the Archiver including access to all Groups. Only a Super Reviewer or Administrator can change a User's access rights - the person's User Type and which Groups the User has access to. Such changes are made via the User Manager, not from the Preferences screen. See Item 6 for details on User management. Change their own Language preference, Time Zone and display Results Per Page in the User Settings section of the screen. Modify the domain-wide default settings for Language preference and Time Zone in the Domain- wide Settings section of the screen. Time Zone can convert all message times of sending and receiving to the time zone chosen. Use the Specify Secondary Domains field to add any additional domains used by the company. For example, if the primary domain is hughes.com, but the enterprise also uses hughes.net, the Adminstrator can enter that domain name here and then click Add. There is no limit to the number of secondary domains that can be added. Specify the email addresses of all Users who should receive the Message Archiver Daily Reports. Type in the email address and click Add. To remove an email address, highlight it and click Delete. There is no limit to the number of email addresses that can be added. Please note that the Message Archiver Daily Report is provided for monitoring purposes only and is NOT intended for audit or reconciliation purposes. You access the main Message Archiver pages from the Main Toolbar located across the top of the page. Below the Main Toolbar in a light blue area are page-specific icons that you can use to refine your search or take actions on messages. 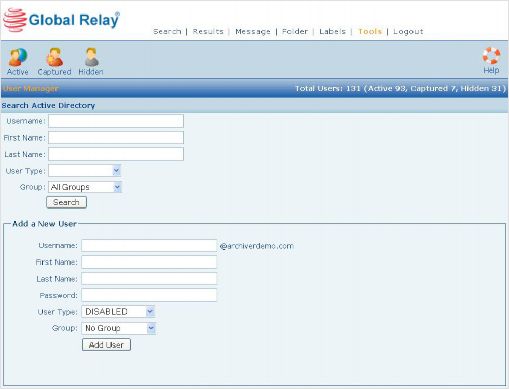 At any time click on the Help icon to send Message Archiver related questions directly to Global Relay's support staff. Support is available 24x7. The Command Line, located in the darker blue area under the Action Icons, contains a summary of the current page contents and dropdowns for quick sorting and status assignment. Screen 7 provides more detail. link displays in bold orange (Search) when it is being viewed; the link turns to blue when you are viewing any other pages. For those with Compliance Tool access (Super Reviewers and Reviewers) the main part of the Standard Search page has three columns (see Screen 5). The first two columns display fields that you can use to filter your searches. The third column is the Compliance Dashboard, which is essentially a graphical representation of the 'Flag' field in the second column. See Item 2.5 for more details about the Compliance Dashboard. Standard Users do not have the Compliance Dashboard third column in their Search Page, nor do they see the labelling/flagging fields of the second column. Reset - reverts you to the search fields selected in your previous search from your current login session. Click on the Results page link to display the previous search results. If the Results page link is grey, you have not performed a previous search. Standard - takes you back to the Standard Search page. 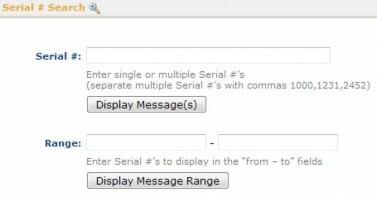 Serial# - enables the display of single or multiple message ranges based on their serial numbers. Each message is sequentially serialized based on time of import into the Message Archiver. New - enables you to compose a new email (to either an internal or external recipient) directly from the Message Archiver interface via Webmail. Messages sent from here will be sent from the address that the User is logged in as and will also send a BCC of the message to that address. Refer to Item 3 for detailed instructions on performing searches for messages. The Command Line is found on the Search Page, located in the dark blue area near the top of the screen. The Command Line displays the total number of Users in the system, broken down into Active, Captured and Hidden Users (see the red highlighted area in Screen 7). Active Users are all those who have been added into the system directory and can be managed. Captured Users are those who have actively sent out emails and were automatically captured by the system, but cannot be managed (put in Groups or give access to the Archiver) until they are made Active. Hidden Users are those that no longer need to be managed, i.e. ex-employees, non-human addresses. This allows you to put certain Users 'out of the way' from a management perspective. User Types are more fully described under Item 1.2. Search Page for those with Compliance Tool access provides System information not available to Standard Users. This includes numbers of Users and the total number of messages currently archived in the system (see the red highlighted areas in Screen 7 immediately above for the numbers). The Active, Captured and Hidden words in the darker blue section are click-throughs and when clicked will take you to those specific directories of Users. The screens for Super Reviewer and Administrator are different in other ways. 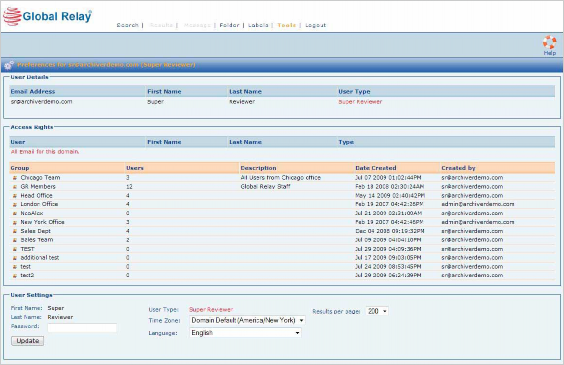 The Super Reviewer screen has additional compliance functionality that the Administrator does not have. Refer to the subsections below for details. For a Date Range search use the Start Date and End Date fields located near the top left of the screen. For greater detail on performing searches, see Item 3. Personal email storage and retrieval. It should be noted that every User's captured messages are always safely and securely stored and organized by Global Relay. 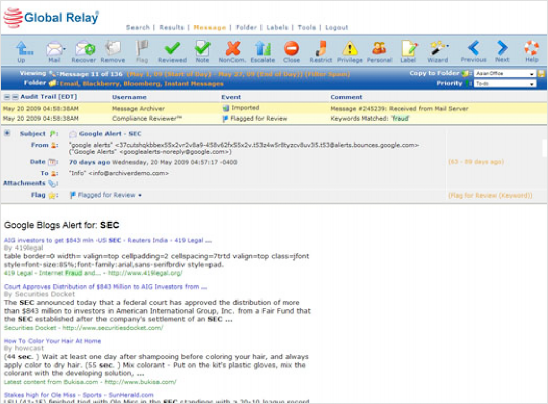 Users who have been granted Standard access can use the simple-to-use search capabilities available to them (through the Search Page), to regularly access all of their stored email and attachments (along with other message types that Global Relay is capturing, such as Bloomberg, Thomson Reuters, Instant Messages, and Blackberry (PIN and SMS)). Any Users who delete a message from their corporate mail system is still able to immediately access that message through the Archiver. These Standard Users will however, not be able to see any of the Compliance flagging, Comments or associated Audit Trails that you have put on their messages. Like ANY other User type, they cannot change the content of a message that is in the Archiver or delete a message from the Archiver. The search capability of the Message Archiver is much superior to that provided by Outlook and no email will ever be lost or deleted from the Archiver. There is no extra cost to grant your Users this access. displaying them. To do so, click the Calculate button, found at the bottom of the left column. The results will be displayed in brackets to the left side of the buttons, shown as "7139" below. Flag field - in the middle column. Use this field to search on the current flagged or marked state of a message. 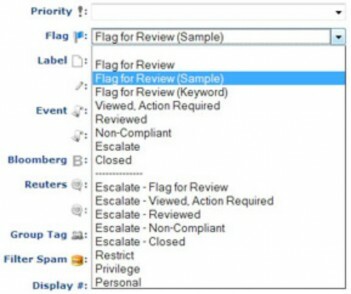 Using the Flag field you can easily access your 'Flagged for Review' messages. These are the messages that the system has automatically flagged by predetermined Flagging Rules (Keyword/Phrase and/or Random Sample) or that another reviewer has manually flagged. See Item 3.6 for more information on Flagging Rules. Label field - in the middle column. Use this field to search for messages that have been tagged with a defined Label / Comment. For details on searching by Labels, see Item 3.7. The third column, referred to as the Compliance Dashboard, is not available to Standard Users and User Administrators. It is essentially a graphical representation of the Flag field options exercised in the second column. For more details about using the Compliance Dashboard see Items 2.5 and 3.6.2 . Another addition to the Compliance Reviewer's screen is the Sample field (shown in Screen 12 below) which is located beneath the Results Display Preferences field (see it in Screen 11 above). Sample allows a User to perform a manual random sample of a particular search. For details on performing searches using random sampling, see Item 3.10.2. . The Results Page (see Screen 13 below) displays all the results matching your search criteria. You can quickly scan all the messages and determine which ones need to be reviewed or otherwise acted upon. Depending on the number of matches found, the results may need to be displayed across multiple pages. Use the Page Arrows (Screen 14 below), found at the bottom right of the Results Page, to move between pages. The single arrow skips to the next/previous page (in whichever direction you select) and the double arrows allow you to skip to the first/last page. The Results Page link is displayed in orange (Results) when it is being viewed. The link turns to blue when you are viewing any other pages. If you click on the link from another screen, you will be returned to the last search result of your current login session. The Results link will be greyed out until the first search is conducted. The Flag column on the left side of the Results Page (viewable only by Reviewers and Super Reviewers) displays the current flagged or marked status of a message. You can take actions on individual messages or a set of messages using any of the Action Icons across the top of the page (see Screen 15 below). You can sort your search results (see Item 4.1) and save messages in Folders without having to open and review them first (see Item 4.3). The Command Line in the dark blue area beneath the Action Icons contains a summary of the current page's contents and dropdowns for quick sorting and status assignment. to perform an action on. For more on Flagging options and message states, refer to Item 3.6 and subsections. The Message Page (Screen 16 below) displays the content and information about an individual message. The Message link displays in bold orange (Message) in the Main Toolbar when a message is being viewed. The link turns to blue when you are viewing any other pages. The Message link will be greyed out until the first message is viewed. You can take actions on a message in the Message Page using the Action Icons at the top of the page (Screen 17 below). of the current page's contents plus dropdowns for quick sorting and status assignment. Every message page contains an Audit Trail. It is shown in the yellow area near the top of the Message Page. The Audit Trail is a permanent log showing every action that has taken place with the message within the Archiver. Reviewers and Super Reviewers see the entire Audit Trail. System and User Administrators can see actions not relating to Compliance or Flagging (i.e., when someone has viewed a message or downloaded it, etc.). Standard users only see the actions that they have taken with a message. Any Attachments that are associated with the message. A sample of Message Content (the message body) of an email follows below in Screen 20. This includes the fact that the word 'guarantee' was highlighted as the keyword that caused it to be flagged. It should be noted however, that the same keyword in an email attachment is not highlighted even though the message is flagged. The other items on the Main Toolbar (excluding the Logout link) give you swift access to the Message Archiver Compliance Tools (see Screen 21 below). Folders - The "Folders" dropdown menu offers quick links to the Folder Manager and to each of the specific folders that you have created. See Item 5.4 - Using Folders. Labels - The "Labels" dropdown menu offers quick links to the Label Manager and to specific Labels that you have created. Item 7.2 - Labeling Messages, and its related subsections. Preferences - Select this item to change your own User preferences, such as Language (of the interface), your password, Time Zone, etc.. Administrators also have access to change domain- wide settings. Preferences are available to all Users that have Message Archiver access. 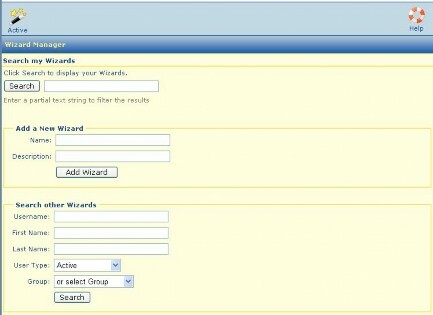 Wizard Manager - Create and manage "Wizards" to define actions that you want the system to take with specified messages. See Item 7.3 - Using Wizards, and its related subsections. This Tool is available to Reviewers and Super Reviewers. User Manager - Allows you to create and manage your Users (grant levels of access, change paswords, etc). 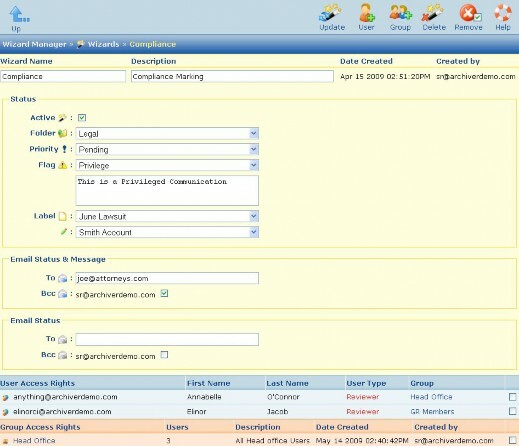 Group Manager - Create and manage Groups to organize sets of Users and control access rights. See Item 6.3 - Working with Groups and Item 6.1 - Adding Users. Flagging Rules - Search for and modify the list of Keywords and Phrases for flagging. Add new terms and exclude phrases from being Flagged. See Item 7.1 - Working with Flagging Rules and related subsections. Random Sampling - The Message Archiver can automatically flag a specified Random Sample % of your incoming, outgoing and internal messages for Compliance review. See Item 3.10 - Performing Sample Searches. The Compliance Dashboard (Screen 22 below) is available to Reviewers and Super Reviewers on the right-hand side of their Standard Search page (see Item 2.4 - Overview of the Main Screens for more on this screen layout). It allows for quick access to compliance statistics and searches. It sets the Flag filter for your search. You have the ability to set the date range at this point (Today, Yesterday, Last 7 Days, Last 30 Days), or use the Date Range specified in the Start Date and End Date fields. Calculate (lower left on Search Page), if selected, will display the number of flagged messages within the flag state selected. By placing a User email address in the To or From field and selecting the Calculate option, you can obtain a quick report on the history of any User. Refer to Item 3 -Searching for Messages - for more detailed instructions on performing searches. The Standard Search page (the default Login page - found by clicking Search in the Main Tool Bar) is where you can perform searches using a variety of filters. Screen 5 - Standard Search Page and Screen 11 - Standard Screen for Super Reviewer - provide overviews of the screens. Item 3 describes how you can perform searches using one or more of the filters available. Once you have selected your desired filters, click the Search Message Archive button at the bottom of the left column, to bring up your results. The Clear button resets all filters to their default setting, effectively providing a clean slate. The Clear button is commonly used before performing a new search. The applicable icons in the search "glow" when search fields are populated. You will likely want to search for messages from a single day or over a range of dates. This is readily available along with other filter(s). Start Date and End Date allow you to set the date range you would like to search. In a matter of seconds you may search for any message that has been sent or received regardless of its age. You are also able to search by time of day, allowing you to narrow your search to specific hours and minutes. Start Date displays the first day in the date range of your search (the default Start Date is 7 days prior). Click on the Start Date to view the pop-up calendar from which you may select the day, week, month and year that your search is to begin with. Hold down the previous or next, month or year buttons to select from a dropdown menu. 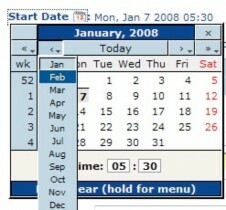 It will provide, for example, the previous 12 years in a dropdown calendar format menu. End Date similarly displays the last day in the date range of your search (the default is today's date). Date ranges are searchable as far back as you have been archiving with Global Relay (including any imported legacy messages). Note the dynamic date help at the bottom of the calendar as your mouse moves across the calendar. The From filter searches for messages sent by a User. The To filter searches for messages received by any User. You may search on the first name, last name, email address, or domain name. Where the "From" header in a message contains a "real name" and/or email address, e.g., "From: John Smith" (with the address jsmith@domain.com, you may search on "john", "smith", "jsmith" or domain.com. You can also search on user aliases. That is, a user may be in the system with more than one user name, with each mapped to the same user. The From and To fields also support boolean searches, meaning you can use AND, OR, NOT and * (wildcard) commands. You can use these same filters to search for messages sent or received by pre-determined Groups by using one or both of the Select Group fields below. You can use the Subject filter to search for messages. Enter any words of the desired Subject line and the Archiver will search for messages with that text. Subject line searching also supports boolean searches meaning you can use AND, OR, NOT, * (wildcard) and proximity commands. The Attachment filter searches by attachment name or file type (.pdf, .doc, etc.). Eight of the most common Attachment types are listed in the dropdown menu similar to that below. 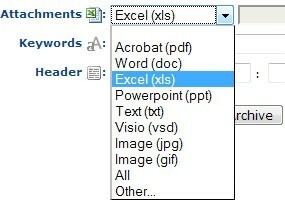 To search for a document type, simply select, for example, Excel (xls) from the dropdown menu. A list of all messages with an .xls file attached will be displayed in the search results. You can also search on 'All' attachments which will return any messages that contain an attachment. This is an invaluable tool to track document versions sent between parties. To search for a document by name or another attachment type, select Other from the dropdown menu and specify the file name in the field, e.g., accountsummary.doc. You can use boolean commands in this field. For example, if you are looking for a .pdf file called 'Service Terms and Conditions.pdf', you could search on service or terms and the message with this file attachment will appear in your search results. You could also look for conditions.pdf (the string as it shows up in the name), but not terms.pdf. Note that in your search results, the messages that meet the attachment criteria will display with a paper clip icon. Use the Keywords filter to search for specific words or phrases in a message (including its header and any attachments that contain text - please note that the Archiver does not support Optical Character Recognition - OCR). If you are looking for a generic keyword, you may also want to use some of the other search fields to narrow down those results. To look for a specific phrase, place it in quotations, i.e., "confidentiality agreement", which will return messages with that exact phrase. Keywords also supports Boolean searching, meaning you can search 'confidentiality AND agreement' (any message containing both of those words, not necessarily strung together), 'confidentiality OR agreement' (any message containing either word), 'confidentiality NOT agreement' (any message containing the word 'confidentiality' but not containing the word 'agreement'). In addition, keyword searching supports wildcards (*). For example, a search for 'run*' would also return results for 'running' and 'runner' etc. You cannot start a search term with a leading wildcard (at the beginning of the word) such as '*unner'. When searching keyword(s), the searched term(s) will be highlighted in bright yellow in the actual Message page (although keywords will not be highlighted in attachments). Keyword / Boolean searching can be very complex. Please contact Global Relay if you have specific questions as to how it works. 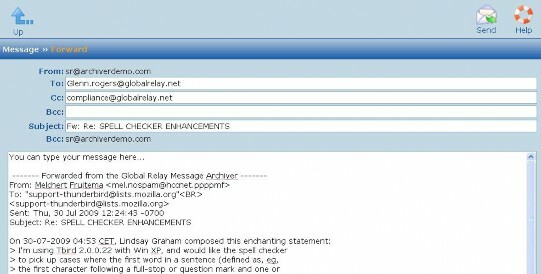 Global Relay can also provide you with another document solely devoted to the searching capabilities of the Message Archiver. The Flag field (click on Flag menu in center of Standard Search) allows you to search for the current flagged or marked state of a message. To find your flagged messages, set this field to 'Flagged for Review'. This will provide a listing of all of the messages that are currently blue flagged for review for the chosen date or date range and/or Users. A blue flag indicates a message has been flagged on import by predetermined Flagging Rules (keyword, phrase, random sample) or, less commonly, has been flagged manually by a Reviewer or Super Reviewer. If you simply select Flagged for Review, your search will find all messages that the Message Archiver has flagged (and are still flagged), whether by keyword/phrase or by random sampling. 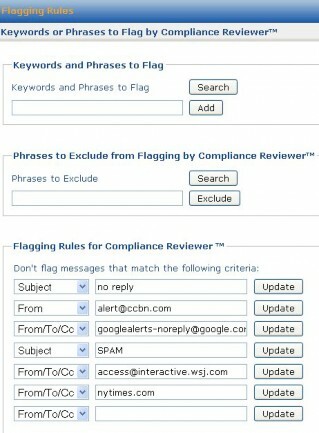 If you want to limit your search to one or the other, select Flagged for Review (Keyword) or Flag for Review (Sample). You can select from the following additional options in the Flag Field dropdown menu (below) to narrow your search. 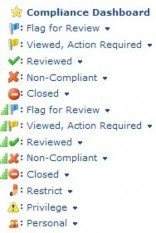 The various flagging options, along with related icons that are available as quick links in the Compliance Dashboard, are outlined below. Viewed, Action Required - indicates a message Flagged for Review has been viewed; but, no action was taken. Typically, the Reviewer skipped the message with the intent of following up at a later date (yellow flag ). Reviewed - refers to messages that have been reviewed and marked as compliant (green check ). Non-Compliant - indicates that a message has been reviewed and was considered Non-Compliant. Typically, a comment (optional) will be appended to the Audit Trail briefly describing the issue (red X ). for escalation (green stair ). closing the file (red circle ). Escalated, Flagged for Review - indicates a message currently flagged for review has been escalated to a Super Reviewer (green stair with blue flag ). of following up at a later date (green stair with yellow flag ). the message is acceptable (green stair with green check ). Escalated, Non-Compliant - indicates that a non-compliant message has been escalated to a Super Reviewer (green stair with red X ). surrounding closing the file (green stair with red circle ). ***Restricted Message*** (red card ). Privileged message (yellow triangle ). Personal - indicates that a message is personal (sensitive or private, non-business communication). Messages can only be marked Personal by a Super Reviewer. Users with appropriate access rights can view the message header in the Results page; however, the subject will be replaced with the words *** Personal Message ***. Only Super Reviewers and the User that sent or received the message may view a Personal message (red shirted icon ). For information on how to mark messages with these flags, see Items 4.2 and 5.2. Basically, the Compliance Dashboard is a graphical representation of the Flag options described immediately above in Types of Flags and Message States. To perform a search, click on one of the items in the Compliance Dashboard and then select your date or date range from the menu as shown immediately below. Note that the Date Range option will use the Start and End Dates shown in the first column of the screen. If you select the Calculate option, the number of search results will appear in brackets next to your selected option (e.g., (351, 61, 148) in the screen immediately above). o Any (i.e., all Priorities), Urgent, Important, To-do, Pending, Notable, Personal and Done (see Screen 28 below) which enable a simple flow-up process. You can use the Priority filter in conjunction with a Flag option to narrow your search. For information on how a reviewer can mark messages with a Priority level, see Item 4.2.2. Labels are essentially systems of master folders called 'Labels' with subfolders called 'Comments' that can be created by Reviewers and Super Reviewers and then used to organize and categorize messages. For details on creating and assigning Labels to messages, see Item 7.2. To search for messages that have been tagged with a defined Label / Comment, use the Label dropdown in the second column of the Search page. There are no default Labels in the Message Archiver, therefore the dropdown menu will display only those Labels that have been created by your compliance reviewers. Once you have selected a Label (in the example in the Screen below, the Label June Lawsuit has been selected), the dropdown below it will populate with all of its defined Comments (i.e., subfolders). In the Screen example, the Laidler Account Comment has been selected. The Search Results page will display only messages that have been marked with the June Lawsuit / Laidler Account Label / Comment, and any other search criteria you have requested. Use the Event field to search the history of flagged messages. Event searches the message Audit Trail, which maintains a complete history of all Events (actions) associated with a message in The Archiver. Events are often used in combination with other search fields to connect current message status with a historical event: for example, messages currently flagged as "Reviewed" that were historically "Flagged for Review" by "Random Sample". If requested for Audit purposes, Compliance Officers can provide details of their review process to auditors. instance of a message being flagged or marked to a different state. These include the same flag options described in Item 3.6. When a Super Reviewer selects an Event, the optional Event User field immediately below the Event field is enabled. Enter a User's Username, e.g., john.smith, to search for all messages that a specified Reviewer or Super Reviewer has taken any actions with. The Message Archiver then searches the Audit Trails of all messages for any actions taken by this User and displays the result in the Results page. This is a way that Super Reviewers can verify what others are doing in the system. For instance, if a Super Reviewer needed to confirm that a Reviewer had completed their weekly review, they could perform this search. Or, if an employee was leaving a firm, a Super Reviewer could go into the Message Archiver and see every message this person had downloaded or recovered from the archive. For descriptions of additional Events that appear in this list, including "Reply," "Recover." and "Forward," refer to the discussion in Item 5.1 on emailing options. The Message Archiver assigns a unique sequentially serialized identifier to every message, based on import into the system (message #1 is the first message imported). Note that in the event legacy messages have been manually imported after activation, message #1 may not be the oldest message. Serial numbers are ideal for eDiscovery, compliance, HR, legal, Technical and organizational reference purposes. in the top left of the Search page to bring up the Serial # Search screen (Screen 29). Enter the serial number to bring up a Results screen with the matching message listed. Click on the Subject to open and view the message. Alternatively, you can search for a range of serial numbers, in the screen shown above. manually activated sampling for a specific search. (Keyword). Flagging for Random Sampling will be applicable for all messages that haven't already been flagged for keywords or phrases. from the main toolbar as in the screen below). In the resulting screen (below), set the percentages for the types of messages, as shown. Some companies may be less concerned about Incoming or Internal messages and more interested in Outgoing messages. Some may decide to ignore Internal messages altogether. In general, decisions are made based on your firm's unique compliance requirements, as well as on the size, nature and structure of the company. types (Incoming, Outgoing and Internal). To perform an Automated Random Sampling search, from the Standard Search page, select the Flag option Flagged for Review (Sample) (see Screen 32 below) and any other desired filters (date range, etc.) and click the Search Message Archive button. In addition to Automated Random Sampling, you may wish to limit the number of results you get for a specific search based on your chosen search filters. Sampling of messages is often conducted for employee monitoring during probationary periods. Consider, for example, that you would like to review a sample of messages sent by a temporary employee over a 90-day probationary period before hiring the employee full-time. When you select the random Sample option, your search results will display 4% or 10% (or whatever percentage you have set) of the User's messages. Thus you could then review these as representative of all the User's messages over the time period. To have the Message Archiver perform this type of sample search, you must check the option on the bottom right of the Standard Search screen. 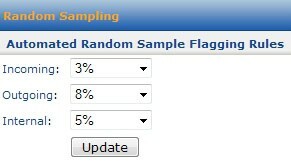 In the Sample field, select the Yes radio button and select a percentage from the dropdown menu. In the example in the screen below, the User has elected to use a 50% sample of messages. Note that ALL messages are searched for the specified search criteria, but only a percentage of those found are displayed. If you select this option, the system will display on the search Results page a percentage of messages that meet your search criteria rather than all the messages that meet the criteria. For example, with a 50% sample and a total of 20 messages that meet your search criteria, your result would be a statistical sampling of 10 of those 20 messages. Please note that, unlike the automated Random Sampling outlined in Item 3.10.1, the manual random Sample does not 'flag' the results of these searches. Once you have performed a search, the Results Page (Screen 13) will display a list of messages based on the search filters you selected. Item 2.4.4 provides an overview of the screen. This section describes actions you can take with the search results. 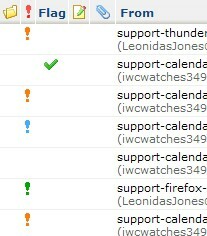 On the Results Page the Flag column will display the current flagged or marked status of a message. Say, for example, you searched for Flagged for Review messages within a specified date range. In this case, a single blue flag would appear beside each message. These messages are flagged because they contain at least one of the predetermined keywords or phrases (in the message body, header or attachment) chosen by your Administrator or Super Reviewer, or because they are part of your automatic Random Sampling. By clicking on the checkbox at the far right of each message, you can select that message to mark, flag, add to a folder or mark it with a priority. Please note that clicking in the top checkbox above the first message in the far right column will select all of the messages on that page. The Page Arrows at the bottom right of the Results Page allow you to move between pages. The single arrow skips to the next/previous page (in whichever direction you select) and the double arrows allow you to skip to the first/last page. You can sort your search results based on the From, To, Subject and Date fields. Click on the column header to arrange your results in order (the default is by Date, with the most recent messages at the top). A second click will sort in the reverse order. A small arrow appears next to whichever category you are sorting by. You can toggle between the Simple date (i.e., "Last Week" or "3 days ago") and the Standard date (i.e., "June 20, 2009 03:03AM") by clicking on the date of one of the messages. Each of the Action Icons at the top of the Results Page has a small box with a green check mark on it (see Screen 34 below). This means that by clicking that icon, you are affecting any and all messages below that you have checked off. Please note that messages that are marked in this manner will show in the Audit Trail that they have been marked from reading the header (Header Viewed) rather than by viewing the message (Message Viewed). Once you have marked those messages as Reviewed - Header Viewed, you can click on the Refresh icon. Only messages that are still flagged for review will appear on the Results page (i.e., the messages you just marked as Compliant - Header Viewed will not appear). You can also mark messages in the search Results Page with a Priority level. Priority ranges from "None" to "Urgent," as shown in the Priority Dropdown Menu screen below. To mark one or more messages with a Priority level, first select them by checking the checkboxes at the far right of the messages. Select the desired level from the dropdown menu on the right side of dark blue bar near the top of the Results page. Then click the word Priority, to the left of the dropdown. an individual message, the action of assigning the Priority level and the level itself will clearly show in the Audit Trail. next to the Date column heading (Screen 37) to select all the results, and then click on the Privilege icon. You can mark some or all messages with other message states using the Action Icons in the same way. If you want to put the results of a search (or individual messages) into a Folder (which you have already created in the Folder Manager), first either select a subset of messages by checking the checkboxes at the end of the desired message rows OR select all messages on the page by checking the checkbox in the gray header row, next to the Date column. Then select the appropriate folder from the dropdown menu on the right side of the Command Line (dark blue bar) near the top of the Results page (see the screen below). Click the word Copy to Folder, to the left of the dropdown and you will have two options, 'All Messages' (the full results of your search), or 'Selected Messages' which would be any messages you selected on the right side check boxes. You are not physically moving the message, just adding a link to that message in the folder. Therefore, the same message can be in multiple folders. See Item 5.4 for details on using or creating Folders. Viewing and Saving Messages describes other actions you can take with Search results. To view individual messages or conversations, click on the Subject of a message in your search results list as shown on the screen below. The resulting Message page will display the content and information about that individual message. Item 2.4.5 provides an overview of the screen. menu of options. This feature will allow you to deal with an issue while you are doing your review, rather than having to follow-up at a later time. o 'Reply' messages automatically send a BCC'd copy of the message to the email address you are logged in as. Keep this in mind, if you log in as the SysAdmin account or another account that is not a real email address, when you Reply or Forward a message and the receiving party responds back to you, that message will actually go to the address you are logged in as. Reply All - The original body and header of the message and any note you include is emailed to all of the original message participants. 'Reply All' messages automatically send a BCC'd copy of the message to the email address you are logged in as. Forward allows you to forward a message to anyone you wish from the Message Archiver. It will also allow you to add a note to the message which will be included with the original body and header of the message (see the screen below - Forwarding Messages). Forwarded messages automatically send a BCC'd copy of the message to the email address you are logged in as. It should be noted that if you are not logged in with your own email address (i.e. you are logged in as admin@domain.com), you will not receive the BCC message. The Recover icon allows you to quickly send yourself (to the email address you are logged in as) a copy of the message in its original format. Once a message has been reviewed you can choose one of the icons near the top of the Message screen to mark it as : Reviewed, Reviewed with a Note, Non-Compliant, Escalate, Close, Restrict, Privilege, or Personal. o Reviewed - Select this option for messages that were flagged but have no negative compliance issues for the firm. o Reviewed with a note - Use this option to mark a message as compliant and leave a note in the Audit Trail. This action allows you to leave a comment that will be permanently associated with that message. o Non-compliant - Messages that contain a breach of your firm's policies and procedures are deemed to be non- compliant (may include an explanatory comment). See the next following section below - Item 5.2.1 for more detail. This action allows you to leave a comment that will be permanently associated with that message. o Closed - This indicates that the non-compliant issue has been addressed, investigated and resolved. This action allows you to leave a comment that will be permanently associated with that message. o Escalated (Flagged for Review, marker for second level of review) - Use this option for messages that require further investigation before an action is taken. Escalating a message does not mark the message as compliant or non-compliant; it simply marks the message in a different way so that it can be easily found. Escalated is typically used by a Reviewer, performing a 1st level of review, who would like to bring a message to the attention of a Super Reviewer (2nd level of review). This action allows you to leave a comment that will be permanently associated with that message. will change its Subject line to ***Restricted Message*** and will make it viewable only by a Super Reviewer. This action allows you to leave a comment that will be permanently associated with that message. o Attorney-Client Privileged - Messages that contain Attorney-Client Privileged information can be marked as Privileged. Marking a message as Privileged, will change its Subject line to *** Attorney-Client Privileged *** and will make it viewable only by a Super Reviewer. This action allows you to leave a comment that will be permanently associated with that message. Personal - Marking a non-business-related message as Personal, will change its Subject line to ***Personal Message*** and will make it viewable only by a Super Reviewer and the User who sent or received the message. This action allows you to leave a comment that will be permanently associated with that message. 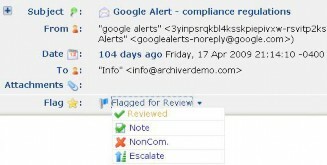 o Viewed, Action Required - When a Super Reviewer views a blue flagged message but does not mark it in any way, it is time and date stamped and marked with a yellow flag ('Viewed, Action Required'). In this case, you can no longer mark the message as Reviewed, but would have to mark it as Reviewed with a Note which allows you to explain, with an optional note, why you did not take action with the message the first time you read it. Any of the above actions will be recorded in the message's Audit Trail. Once a message has been marked as Reviewed, you will automatically be directed to the next message in your list. While viewing a message, you can also use the arrows in the top right corner of the screen to navigate to the Previous or Next message. Icons toolbar to bring up a pop-up as shown in the screen below. 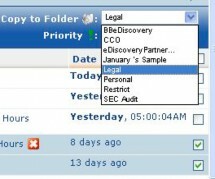 "Legal" folder, and the icon, indicating the "Important" Priority status. Navigate to the screen for the next message in your search results list (Submit and go to Next Message). Refer to Item 5.2 for details about each of these actions. After you have selected one of these four options, a pop- up window will display, confirming the action and presenting additional actions for the message. Specifically, you can add the message to a Folder (see Item 5.2), assign a Priority (see Item 4.2.2), or assign a Label/Comment to the message (see Item 7.2). Folders can be created for a several reasons: as a tool to save the results of searches, categorize messages, or to help organize data. Folders can be shared and multiple Users can have access to a Folder, however only Super Reviewers can create the right to share. The User's access level will determine which messages within that Folder they can view. All message types can be added to Folders. When a message is added to (or removed from) a Folder, the message itself is not removed from the system; only a link to that message is moved into (or out of) the Folder. Therefore, you are still able to perform searches outside the Folder that include that message and find it. A message can also be placed in several Folders at the same time. All actions taken with a message will be recorded as an Event in the Audit Trail. 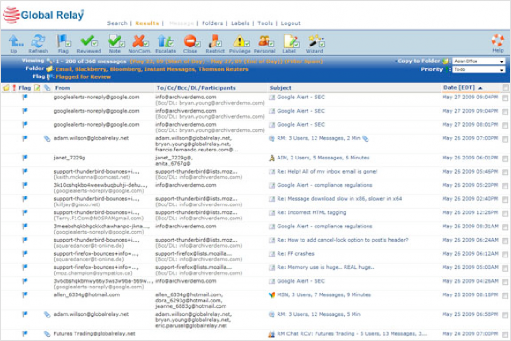 Folder Manager is the Message Archiver compliance tool that allows you to work with Folders. To create a folder, select Folder -> Folder Manager from the main toolbar to display the Folder Manager screen shown below. Enter a name for the Folder and optionally a description for the Folder contents. All Folders that are created will automatically show up in the Standard Search page as an option under the Folders sections. 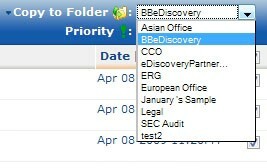 The Folder(s) created by Users will have an asterisk (*) beside them, indicating that they are Folders that are personal Folders, not system Folders (such as personal Email, Instant Messages, Blackberry, Bloomberg and Thomson Reuters). screen (below) displays information about each folder, including the number of Users ( ) and Groups ( ) that have access to each of them. If you have a large number of folders, you can filter the results by entering a partial text string. 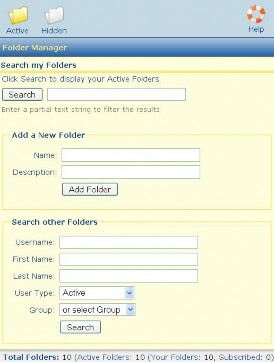 See the "Search my Folders" section of the Folder Manager screen - Screen 45 (2 above). A Super Reviewer may wish to search to see which Folders other Users have access to. In the "Search other Folders" section of the Folder Manager screen (Screen 45), you can enter a Username and get back a screen that will indicate how many Folders that User has access to, and how many of those are shared, e.g., 3/10 would indicate the User is sharing 3 of his 10 Folders. Then click on the User's email address on the left to retrieve a list of those Folders. Comments textbox; click on the Update icon to save the notes. To view the messages within a folder, select Folder -> <folder name> from the main toolbar. Use the Page Arrows at the bottom of the screen to navigate to any additional pages. A Folder can be shared by more than one User; this feature allows one User to gather information and then have other Users collaborate. The creator of the Folder (who must be a Super Reviewer) can share it with a User(s) or a Group. Adding a User(s) or a Group does not automatically grant the User(s) a new access level; they will only be able to see the messages in the Folder that they normally would have access to. Refer to the sections below for details on sharing folders. confirmation window. Click on the Up arrow (in the upper left) to return to the Folder screen. You will see that the User has been added. Remove button to confirm the action and close the confirmation window. The list of Users in the Folder screen will automatically refresh. confirmation window. Click on the Up arrow to return to the Folder screen. You will see that the Group has been added. for the Group(s) to be removed. Then click the Remove icon at the top of the screen. Click on the Remove button to confirm the action and close the confirmation window. The list of Groups in the Folder screen will automatically refresh. either the Results or Message Pages can be added to a Folder. To add a message(s) to a Folder from the Results Page (Screen 13), first either select a subset of messages by checking the checkboxes at the end of the desired message rows OR do not check any messages if you want to put ALL messages from that search in a Folder. Choose the Folder by using the dropdown menu above the checkboxes and then click the words "Copy to Folder" to the left of the dropdown menu (see Screen 48 below). Then click either Selected Messages (the ones you selected by checking them off), or All Messages, (the complete result set from your search). This will move a link to the message(s) into the folder. To confirm that this was successful, a folder icon will appear on the left side beside the message(s) in the Results list. Note: If a message has already been placed in a folder, and you copy it into an additional folder, a folder icon with a plus sign appears to indicate the additional folder. To add a message(s) to a Folder from the Message Page (Screen 16), go to the upper right side of the screen and choose the correct Folder using the dropdown menu below the "Previous" and "Next" icons. Then click the words "Copy to Folder" beside the dropdown. In the gray Header area of the Message screen, you will see the Folder has been added. Messages can be removed from a Folder using two methods; from within the Folder or from within a message. Using the folder method, you can remove multiple messages at the same time. on the gray bar next to the Date column). Then click the Remove icon near the top of the screen. Please note, the check ALL will affect all of the messages on that page (and no subsequent pages). A single message can be removed from a Folder from within the Message screen. The Folder is referenced at the bottom of the gray Header section. The Folder name has a dropdown that will allow you to remove the message from the Folder. It must be noted that before you can delete a folder, you must first remove all Users (see Items 5.4.6 (Users) and 5.4.8 (Groups)) and all messages (see Item 5.4.12 (Messages)) from the folder. checkbox in the far right of the folder's row and click the Delete/unsubscribe icon near the top of the screen. If you have many Folders, you may want to perform a quick search for a folder using Folder Manager. Go to the main toolbar and select Folder -> Folder Manager. In the Search My Folders section, enter a partial string to filter the results, e.g., "audit" and click Search. The search results will display a list of only those Folders with "audit" in the Folder Name. 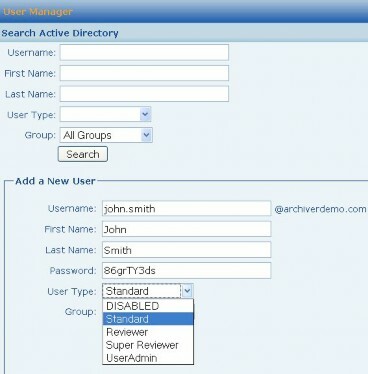 The Message Archiver provides a User Manager tool to enable the Super Reviewers or Administrators to add Users and manage Users in the system. You can access the tool from the main toolbar by selecting Tools -> User Manager. On the resulting User Manager Screen (see Screen 50 below) you can add a new User and assign the User Type and Group membership. See Item 1.2 for the complete Description of User Types. To add a new User, go to the Add a New User section of the User Manager Screen (bottom half of Screen 50), enter the Username, First and Last Names, and Password for the new User. Use the dropdown menus to select a User Type and optionally to assign the User to a Group. Please note, passwords must be at least 6 characters long and can be a combination of alpha-numeric or other characters. They are also case-sensitive. Passwords with a combination of numbers, letters, characters and cases are the most secure. Never share your Message Archiver password with anyone. You can assign a new User to an additional Group or Groups. To add or do modifications to any User, access the User's User Details Screen (Screen 54) and add or modify the User from there. See Item 6.2 - Managing Users, for details on modifying. 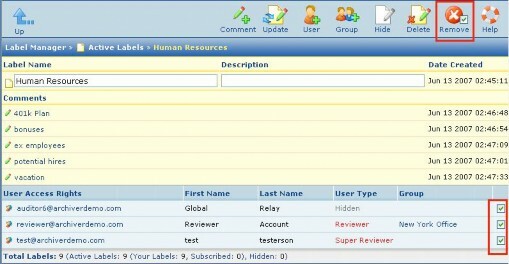 As a Super Reviewer or Administrator, you can use the User Manager tool to modify User details, including the User's Access rights, User Type, Group membership, and other information. 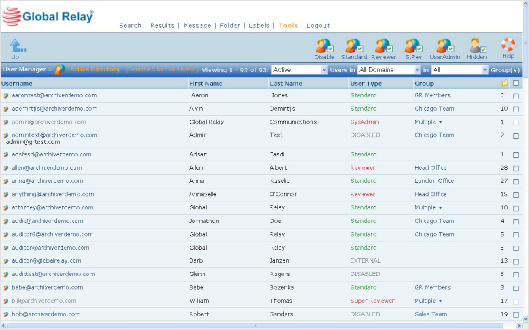 You can view a list of all Users in the system by accessing the Active Directory. See 6.2.1 immediately below. Group column, click on Multiple to display the group memberships. From the Active Directory screen, you can reassign User Types to one or more Users at the same time by checking the checkbox(es) at the end of the User's row(s) and selecting one of the User Type icons at the top of the screen. A confirmation pop-up will display. Select the checkbox in the blue header row to select all of the Users on that page at once. To modify a User's information, click on an individual username in the Active Directory list to bring up the User's Details screen shown immediately below. Alternatively, you can narrow your search for a User in the system rather than going through the entire directory. Select Tools -> User Manager, and in the Search Active Directory section of the screen, enter text in one or more fields and click Search. The search results will display in a new window. In the Screen immediately below, for example, the search on First Name = bob produces two results. 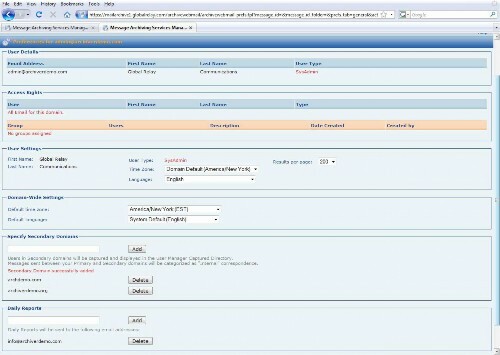 Click on the desired Username to bring up the User's details in the User Details Screen above. Typically, Standard Users will only have access to their own messages. A Reviewer, however, may have access rights to one or more Groups and/or one or more Users. To get to the User Details Screen and modify a User's access rights, go to Tools -> User Manager and click on the Active icon to display the Active Directory. Click on a Username to open the User Details screen. and then clicking the Remove icon near the top right of the screen. Click the Remove button on the confirmation screen. would have access only to his or her own account. To give this Super Reviewer access to ALL messages, follow the process below, using the All Mail option. to grant access rights to by checking the checkboxes at the end of the user row(s) OR select All Mail (the very first option on the list) to give access to everyone's messages. Click the Add icon near the top of the screen. It should be noted that if the Add icon is inaccessible (greyed out), the Reviewer already has access to ALL messages. row(s) and click the Add icon near the top of the screen. Close the confirmation window. Change the Display option for this User (# of Results per page). You can view the User's current Group membership(s) in the In Group field of User Settings. If the User belongs to more than one Group, click on Multiple to display the Group names (bottom right of Screen 56 below). (Note that from there you can click on the Group name to go to that Group's screen and view its membership.) 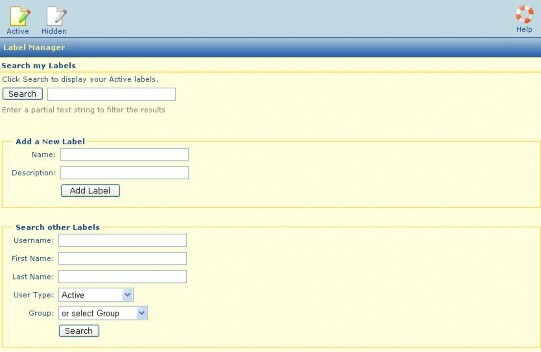 Use the Add to Group dropdown to assign the User membership in an additional Group. You can assign any User access rights to specific Folders and Wizards. For details on assigning and removing access rights of Users to Folders, see Items 5.4.5 and 5.4.6. For details on assigning and removing access rights to Wizards, see Item 7.3.3 and 7.3.4.
to be able to search on a specific subset of your Users. See Item 1.2 for detail on Message Archiver User Types. 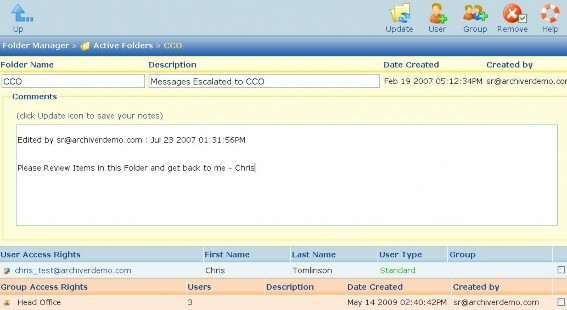 Users can be added or removed at any time by an Administrator or a Super Reviewer. You can add an individual User or several Users to a Group at the same time. Users can also be in more than one Group or have access to more than one Group. You can assign a Group access rights to specific Folders and Wizards. For details on assigning and removing Group access rights to Folders, see Item 5.4.7 and 5.4.8. For details on assigning and removing Group access rights to Wizards, see Item 7.3.5 and 7.3.6. A Group must be created before it can be populated or Users can be granted access to the Group. Only the Administrator and Super Reviewer can create and/or populate a Group. To create a Group, go to the main toolbar and select Tools -> Group Manager. In the Add a New Group section of the Group Manager Screen (Screen 57 below) enter the name of the Group you want to create and, optionally, a description for the Group. Click the Add to Group button. A confirmation message will appear below the button. To display the Group Directory (Screen 58), in the Group Manager Screen (below), leave the Search for Groups textbox empty and click Search, OR click on the Groups icon at the top of the screen. Once you have created the Group Name, you can add Users to the Group. To open the Group, go to the main toolbar and select Tools -> Group Manager. Click on the Groups icon at the top of the Group Manager screen (Screen 57 above) to display the Group Directory (Screen 58 below). Click on the Group's Name to open the Group page. 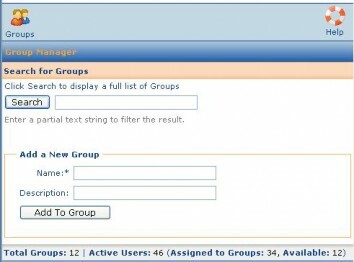 To add Users to a Group, click on the User icon near the top of the screen, and select the Users from your Active directory you want to be in the Group by checking the checkboxes at the far right of the Users' rows. Click the Add icon near the top of the screen. Close the confirmation window. Click the Up arrow to return to the Group screen. You will now see the list of Users you just added. Please note that Users can reside in multiple Groups at the same time. The Message Archiver offers a number of compliance support tools to conduct keyword and phrase scanning to mitigate business and legal risks. For Financial firms, Global Relay typically inputs a basic list of keywords and phrases for Flagging prior to your training session. This list can be modified or made more specific by Administrators or Super Reviewers. From the main toolbar, select Tools -> Flagging Rules. On the Flagging Rules screen (Screen 59 below), you can insert additional keywords and phrases for automatic system flagging, exclude phrases from flagging (usually dealing with Disclaimers), and create rules to exclude certain senders, domains, recipients, or subjects from being flagged. To add new words or phrases to flag, from the Tools -> Flagging Rules screen (Screen 59 above), type the word or phrase in the Keywords and Phrases to Flag text box and then click the Add button to the right. While keywords/phrases are not case sensitive, the Message Archiver does scan for exact matches, so you may wish to add multiple variations of a word or phrase. items (for example, change from "guarantee" to "we guarantee"), enter the revised text and click Update. The list will refresh and you can click the Up arrow to return to the Flagging Rules page. There is no limit to the number of keywords/phrases you can be flagging for at any time. Keep in mind, when you add a new item to this list, you are flagging for it from the time it is added (i.e. it does not go back and flag messages retroactively) until it is ever removed from that list. This means that if you ever needed to flag a keyword or phrase for a limited time (i.e. over a weekend or for a month) you are able to do so. If you need to look for a keyword/phrase retroactively, you can simply conduct a Keyword search from the main Search page. Also see Item 3.5. Global Relay can provide firms with a Keyword/Phrase Guide to help you structure your Flagging lexicon. This guide is aimed mostly at financial firms with Compliance requirements. To exclude phrases from being flagged (generally words you are flagging that show up in Disclaimers), from the Tools -> Flagging Rules screen (Screen 59 above), type the word or phrase in the Phrases to Exclude from Flagging text box and then click Exclude. To get a complete list of keywords and phrases that are being excluded from flagging, leave the text box in that section blank and click the Search button. An alphabetical list will display. To delete a phrase from this list, click Delete to the right of the keyword or phrase. The list will refresh and you can click the Up arrow to return to the Flagging Rules page. Screen 60 shows an example of excluded phrases. To exclude certain senders, domains, recipients, or subjects from being flagged because of your keywords (i.e., non-business-related messages), on the Tools -> Flagging Rules screen (Screen 59 above), use the Don't flag messages that match the following criteria: field. Use the dropdown menu on the left to determine your criteria for excluding items from flagging (i.e., "From/To", "From", "To", and "Subject"). This is a great way to cut down on any flagging that is not related to the compliance of your firm. Each time you add a new item to this list, you will be given another blank field below (notice the blank field at the bottom of Screen 50 - Flagging Rules screen - above). There is no limit to the amount of items you can have on this list. It should be noted that items on this list are still eligible to be flagged as part of your automated Random Sampling, if applicable. To also exclude these items from your Random Sample flagging, contact Global Relay. Label Manager and may be shared by compliance, HR and legal teams. Messages can be labeled individually or in bulk with two methods: by marking a message with a Wizard (discussed in Item 7.3 or manually from the Results page or from the Message view (discussed in Item 7.3.2). Labels may include multiple Comments for categorization purposes. You may search on a Label (which will include all Comments) or on one of the Label's Comments. For search purposes, a Label should be thought of as a folder with Comments being subfolders. Labels and shared Folders are the best method of predefining compliance and eDiscovery structures for collaborative review or discovery of messages. Since Reviewers do not necessarily have access to all Users, their restrictions will continue to apply within the Label; the Reviewer will only see the Users' messages they already have access to. First you create the Label and then you add Comments to the Label. To create a Label, from the main toolbar select Labels -> Label Manager (Screen 62 - Label Manager Screen). Enter a Name for the Label and optionally a Description, and click Add Label. A confirmation message will display. Click on the Active icon in the light blue area near the top of the screen to get a list of all the Labels currently in the system, including the new Label just added. Comment will immediately display in the Comments area of the screen. Since Labels are designed to have more than one Comment, repeat this process based on how many Comments are needed. New Comments can be added at anytime after the Label is created. In Screen 63 below, four Comments have been added to the "June Lawsuit" Label. At any time, you can view your list of Active Labels by clicking on Labels in the main toolbar. Select a Label from the dropdown menu and click on a Comment to display the list of messages in that Comment subfolder. Messages are not actually identified with the Label but with the Comments within the Label. Before a Label/Comment can be added to a message(s), a search must be performed, and it is from the Results or Message screens that a message(s) gets marked with a Label/Comment. blue bar at the top of the screen (Screen 64 below). In the pop-up window, choose the Label and Comment by using the dropdowns and click Submit. You can also assign the message a Priority level or copy it to a Folder from this pop-up screen. in the light blue bar along the top of the screen. In the pop-up window, choose the Label and Comment by using the dropdowns and click Submit. Please note, the Label icon will only be visible if you have already created a Label/Comment. Labels/Comments can be removed from messages from either the Label/Comment or Message screens. icon in the light blue area at the top of the screen bar. Screen 65 below shows one message being tagged for removal from the "Human Resources" Label/Comment screen. You can remove a Label/Comment from a single message when in that Message screen. The Label is referenced at the bottom of the gray Header section. Click on the Label/Comment name and select the Remove Label option from the dropdown menu (Screen 66 below). of the screen. You can add a Group to the Label as well, by using the Group icon in the Sharing a Label screen (Screen 67 below) and selecting the Group names in the same way. shared with other Users, those Users must also be removed from the Label. Remove button at the top of the screen. checkbox for the Label you want to remove. Click the Delete/unsubscribe icon in the light blue area at the top of the screen. Confirm the deletion in the pop-up window. The Message Archiver Wizard Manager compliance tool is available to Reviewers and Super Reviewers. A Wizard is essentially a set of predefined steps that you want the system to take with a message or set of messages. Wizards are an excellent way to handle bulk labelling, foldering and other actions for a number of messages. To access the Wizard Manager, from the main toolbar select Tools -> Wizard Manager. To create a Wizard, enter a Name and optionally a Description, and click Add Wizard (Screen 69). Click the Active icon at the top of the screen to display a list of all the Active Wizards. Selecting Users to send email notification to - you can choose to send either a simple status notification or email the User the full message along with the status notification. Keep in mind, if you are using a Wizard on a large number of messages, you may not want to have the email notification turned on. The message will be flagged as Privilege and labeled with the June Lawsuit/Smith Account Label/Comment. 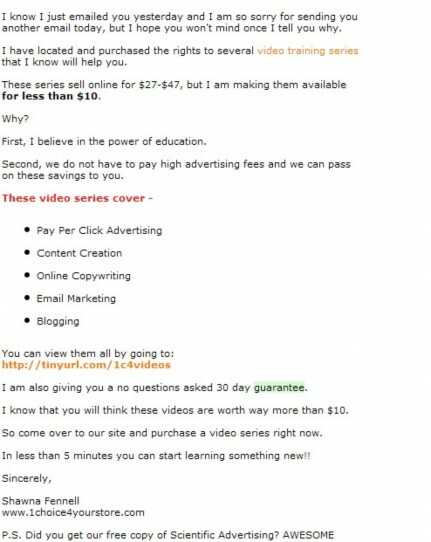 One user (joe@attorneys.com) will be emailed the full message and its status, with one user getting a blind copy. 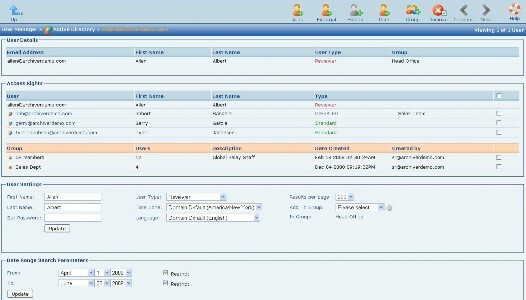 Note also in the Screen that two Users and one Group ("Head Office", comprised of 3 Users total) have been given access to this Wizard (see Item 7.3.3 for information on how to assign access rights). However, only those Users in the Group who are Reviewers or Super Reviewers will actually have access to this or any other Wizard. click to display the dropdown menu (see Screen 71 below). Select the Wizard you want to apply to this set of messages. If your search results span multiple pages, you need to use the page arrows and select all of the results on each screen if you want to assign them all to the Wizard. Alternatively, you can select individual messages if you want to exclude some from the Wizard. You will only see the Wizard icon on the Results page, if you have already created a Wizard. Wizard icon and dropdown on the Message screen to mark the message and have the Message Archiver take the set of actions. When you click on the Wizard name in the dropdown, the Wizard Pop-up Window shown in Screen 72 will open, displaying the Wizard's actions. Note the buttons at the bottom of the window. Click Current Message to apply the actions, close the pop-up, and stay on the current Message screen. Note in the message's Audit Trail that all of the actions will be recorded. 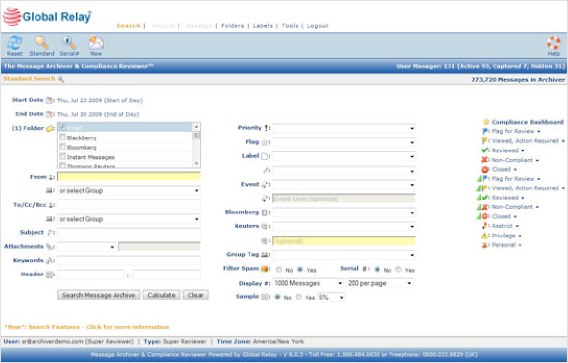 In the example in Screen 73 below, assigning the HR Wizard to the message invokes all of the highlighted actions. Click the Submit and go to the Next Message button to apply the actions, close the pop-up, and go to the next Message in your search results. The actions will still be added to the first message's Audit Trail. Click the Results Page button to return to that screen. If you wanted to find all messages that have been marked with a Wizard, you could perform a search on the Standard Search page with the Event option set to Compliance Wizard. and click the Up arrow at the top of the screen to return to the <Wizard name> screen. The User Access Rights at the bottom of the screen are now updated. screen. Close the confirmation window and click the Up arrow at the top of the screen to return to the <Wizard name> screen. The User Access Rights at the bottom of the screen is now updated. confirmation window and click the Up arrow at the top of the screen to return to the <Wizard name> screen. The Group Access Rights at the bottom of the screen is now updated. the screen. Close the confirmation window and click the Up arrow at the top of the screen to return to the <Wizard name> screen. The Group Access Rights at the bottom of the screen is now updated. Our team of well-trained technical support professionals will gladly help if you require technical assistance. You can contact Global Relay at 1.866.484.6630 or you can log an issue with the Global Relay online technical support ticketing response and status system at support@globalrelay.net. Emergency support is available 24x7. You can also use the Help icon in the upper right corner of the Message Archiver screens to send questions directly to Global Relay. Global Relay, by publishing this document, does not guarantee that any information contained herein is and will remain accurate or that use of the information will ensure correct and faultless operation of the relevant service or equipment. Global Relay, its agents and employees, shall not be held liable to or through any user for any loss or damage whatsoever resulting from reliance on the information contained herein. This document contains information proprietary to Global Relay and may not be reproduced, disclosed, or used in whole or part without the express written permission of Global Relay. Any Software, including but not limited to, the code, screen, structure, sequence, and organization thereof, and Documentation are protected by national copyright laws and international treaty provisions. This User Guide is subject to U.S. and other national export regulations. Nothing in this document is intended, nor does it, alter the legal obligations, responsibilities or relationship between yourself and Global Relay as set out in the contract existing between us.